From the Star Wars collection by Hasbro. Star Wars The Black Series 40th Anniversary Display Diorama with Darth Vader 6 Inch Action Figure Legacy Pack. From the Star Wars collection by Hasbro. 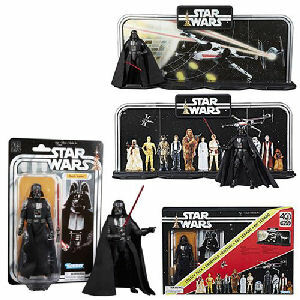 Star Wars The Black Series 40th Anniversary Display Diorama with Darth Vader 6 Inch Action Figure Legacy Pack. A massive action figure display stand unfurls to 22 inches wide by 9 inches tall by 4 inches deep and can hold 11 more Star Wars 6-inch scale action figures (sold separately).